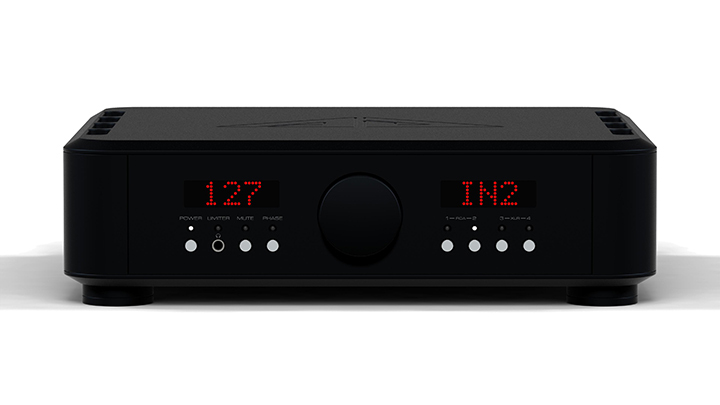 I have to admit that I was surprised when I discovered the £18,650 asking price for Analog Domain’s Isis M75D integrated amplifier. Granted, it’s a lovely piece of engineering and the black surface has a rubbery coating that gives it a pleasing tactility, but nonetheless on size and looks alone I would have put it at around a third of the actual asking price. However, in audio, performance trumps all, and in that respect, the M75D has got it where it counts! At seven years old, the German-based Analog Domain is a relative newcomer to the business. Until recently, the company almost exclusively concentrated on power amplifiers with outputs ranging from 550 Watts up to 4,000 Watts, with outputs that double into a four Ohm load. So, Analog Domain is no stranger to amplifiers, as it has made some of the most powerful designs an audiophile can buy. The Isis, with its 250 Watt into eight Ohm specified output, is relatively restrained in comparison, and at 25 kilos it’s fairly manageable, too. The Isis M75D is a perfect reflection of company founder Angel Despotov’s uncompromising stance on amplifier design, which naturally extends to the choice of component quality and the level of build employed. Take the casework for example; it’s clearly custom machined, but what’s not obvious is that the top and bottom plates are internally machined in a latticework to give excellent rigidity without excess mass, lowering resonance in the process. The black parts are not painted or anodised but latex coated. This produces a deep matte finish, that is both ergonomically and aesthetically pleasing, and long lasting: Despotov make the point that his products are designed to last “at least 25 years”. The actual component count under the lid is not apparently very different from other high-end integrateds at or beyond this level, but great claims are made for the amplifier itself. For a start, it is a fully balanced circuit with “exceptional current output capability” and output impedance that is “essentially zero” giving the Isis what Angel describes as an “insane damping factor”. The power supply is a class G type with separate voltage rails for high and low power outputs. This is an approach used with some considerable succes by Arcam, in its current range of larger amplifiers. According to Angel “the key here is to do it in such a way as to have minimal artefacts in the output signal.” He uses this topology because it keeps the amp’s temperature down, and yes, this is the coolest high power analogue amp I have used. The idea is that the lower the operating temperature, the longer the components inside survive in situ – apparently, every 10 degree Celsius drop in temperature doubles the life of “the most vulnerable components” in an amplifier. This gradual failure of components is essentially why older audio components tend to sound warmer and softer than they once did – it might often appear nice and benign, but this is the sound of your amplifier going out of specification, and ultimately beginning to die. The price is related to the use of high-spec components, but Analog Domain admits that half of the Isis’s price tag comes down to the chassis, which is something one presumes about high-end components but it is nice to have it confirmed. And it is a superbly detailed chassis at that; the way that the heat sinks are concealed from the side but vent top and bottom gives it a clean appearance that doesn’t threaten to lacerate its owner, and the styling is reminiscent of Revox at its aesthetic peak, or Mark Levinson at its best. The back panel is also unusually well endowed on the switches front: chrome levers let you choose between bridged or stereo operation; separate pre-out/power in or internally connected on that rare connector the five pin DIN; and gain can be increased by 8dB on either of the two RCA phono socket equipped line inputs. The other two inputs are balanced giving the Isis just four line inputs in total, which doesn’t seem overly generous but probably enough for most situations. Operation is mildly confused by the auto dimming of the input and level displays. This can be changed and you soon realise that a white indicator means it’s on, so even reviewers get to grips with it quite quickly. I was surprised to find a One4All remote handset in the box for the Analog Domain but am told that a suitably substantial matching handset is on its way and will be supplied to all purchasers of this amp. As the Isis is the first amp that requires control in AD’s range, this is understandable. On the amp itself, there are individual input buttons, power, mute and phase, plus a headphone jack with a limiter light above it. The latter is for the amp as a whole and indicates that you have maxed out the available unclipped volume. This indicator glows white if the limiter is active and red if protection has been activated, such as if the output has been shorted. Limiters are a rarity in high-end audio because they usually compromise sound quality but this amp doesn’t seem to be too compromised and a bit of protection is useful with this much power on hand.